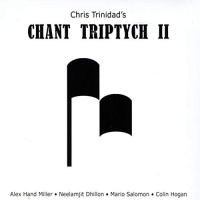 Bassist/composer Chris Trinidad (based in the San Francisco Bay area) presents the second in a series of albums that place Gregorian chant melodies in new contexts. 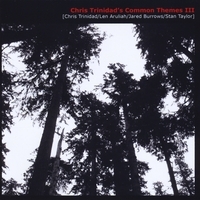 The arrangements combine instruments from a wide array of musical traditions: Indian tabla drums and bansuri flute; Caribbean bongo, congas and other percussion; accordion influenced by Argentinian tango and other folk traditions; Bulgarian tambura (which has double-coursed strings like a mandolin); and guitar, bass guitar and saxophone from Europe and North America. Some of the source plainchant-melodies are reproduced in the original medieval notation on the compact disc case (with Latin wordsas the name implies, chants are vocal music). These arrangements go far beyond the unadorned basic melodies, placing them in a rich harmonic and rhythmic context. They certainly do not sound like anything heard during a church service. In fact it seems unlikely that the average listener would identify the source material at all in a blind listening test. But the chants provided an inspirational foundation for a varied, eclectic program. "Sinite Parvulos" opens with Alex Hand Miller's tambura, playing a Middle Eastern-sounding melody, leading into Colin Hogan's accordion solo and a tambura solo. "Beatus Quem Elegisti" has a head played by Neelamjit Dhillon's bansuri flute (an Indian bamboo instrument), followed by Miller's electric guitar solo. "Dispersit Dedit Pauperibus" features both tambura and an electric guitar solo (presumably overdubbed). "Qui Timent" finds Miller on classical guitar, while "Nolite Diligere" gives space for percussion solos from Dhillon and Mario Salomon. Colin Hogan's accordion playing is a bedrock in the ensemblehe contributes strong solos throughoutbut he finally gets to play the head on "Timeat Eum." Closer "Qui Fecerit" has a different sound, featuring Dhillon on alto saxophone. Surprising it was saved for the end, as it adds a significant new tonal color in both the theme and the solos. 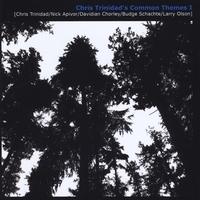 Trinidad points to groups like guitarist John McLaughlin's Shakti, saxophonist John Zorn's Masada and reedist Chris Speed's Pachora as models for this project. There is not the same level of virtuosity as some of those groups here, but it is a strong band with several good soloists (the leader contributes compositions and foundational bass playing, giving solo space to his band mates). 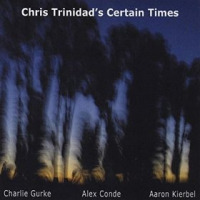 Worth a listen for jazz/world music fusion fans. Track Listing: Sinite Parvulos; Beatus Quem Elegisti; Dispersit Dedit Pauperibus; Venite Filii; Qui Timent; Nolite Diligere; Timeat Eum; Qui Fecerit. 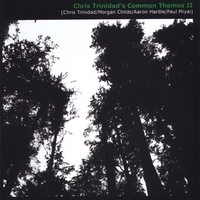 Personnel: Chris Trinidad: bass guitar; Alex Hand Miller: guitar, tambura; Neelamjit Dhillon: tabla, bansuri, kanjira, alto saxophone; Mario Salomon: bongo, congas, campana, maracas; Colin Hogan: accordion, melodica.